Microsoft made some headlines yesterday by taking the covers off of a somewhat anticipated move that was started a few years ago when they first acquired Skype. Microsft Lync will now come to be known as Skype for Business. The new versions of the Skype for Business client, Skype for Business on-premises server and Skype for Business online service that is part of Office 365 will become available in the first half of 2015. Microsoft is bringing together the best of Skype and Lync without losing any of the features, security and manageability that customers care about. In fact, API elements built into the platform that allow developers like ourselves to build apps and additional functionality on top of Skype for Business are remaining in tact. Microsoft is predicting that the familiar user experience that hundreds of millions of Skype users engage with every month will bolster the further adoption of unified communications within the enterprise market. According to some photos appearing on their blog post, along with the rebranding of the name, Microsoft is changing the user interface elements of the older Lync client software so that it looks more like Skype. Although pretty, this won't really affect ProtoSphere 4.0 users next year, as our new version will be relying on the UC Web APIs that are completely under the hood. When talking to people about our 3D virtual environment, we're often asked, "What are your other customers using it for?" This isn't a question you would normally get when for example you were providing a CRM platform. That has a very specific purpose and for the most part customers know exactly what they are looking for. That being said, it's an understandable question in our arena. Even though massively multiplayer online (MMO) games and environments have been mainstream within the consumer space for quite some time, the idea around using them for business purposes has not been fully realized. Many of our customers using ProtoSphere today are indeed “early adopters”. We are seeing these organizations staying at the forefront of technology and they are truly improving their business processes. Ultimately, 3D environments have become an addition to their arsenal of tools to help manage projects, streamline a process, or disseminate information. 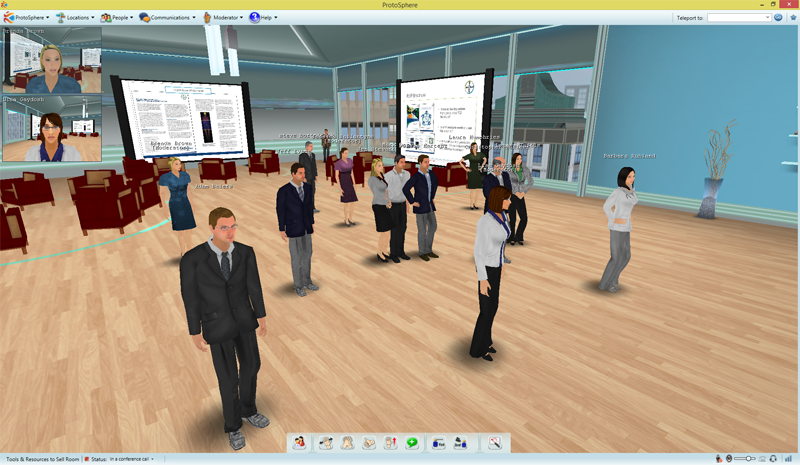 And although the use cases have varied over the years, by far, the most common use we see for our platform is with virtual instructor led training (VILT). The training and learning needs of large organizations are varied. The importance of bringing geographically dispersed subject matter experts together with remote learners is a hurdle that needs to be crossed. Sure, there are plenty of traditional web conferencing tools that are out there on the market today; things like WebEx, Adobe Connect, or even GoToMeeting all have their place and include variations that are specific to training needs. But what happens when you want to deliver training with more than just a PowerPoint? What happens when your training sessions are more than an hour long? Learners need ways to remain engaged, and trainers need methods and tools to keep them all motivated. ProtoSphere has features like private voice zones, the ability to walk around persistent rooms, and multiple screens for interacting with content - all of which help trainers achieve this goal!! Obviously, as the author of this article, and ProtonMedia's self-proclaimed evangelist for ProtoSphere, I'm a little biased - But I'm also a lifelong learner. I absolutely love to learn new things, especially from other people. As a learner, I want to remain engaged! I want to take a hands on approach, participate actively and learn in interactive ways. I need the freedom to be able to do all of that in a safe environment. Our customers who are using ProtoSphere for their virtual instructor led training are taking advantage of technology that was born from the first-person shooters that originated in the early 90's. Technology that was inherently designed to grab your attention, make you focus on a task, and navigate your avatar through the interaction of a fantastical virtual world (and maybe kill some zombies, monsters, and other assorted bad guys along the way). So are we building games for business? Well no, not really, but we are applying that same technology to a legitimate set of business needs and finding it successful, especially for training and learning. In upcoming posts, I will go into a bit more detail on what some of these training engagements look like, the kinds of topics that are being discussed, and the techniques being employed in the virtual environment for those instructor led sessions. Labels: Engagement, Gaming, learner engagement, organizational learning, ProtoSphere for Learning, Synchronous e-Learning, VILT, virtual instructor led training, Why 3-D? 2014 ATD 8th Annual Technology Showcase! Rosenberg is an internationally known expert in the world of training, organizational learning, eLearning, knowledge management and performance improvement. CPLP, CRP, Program Director at the ELearning Guild. Founder, LearningStone, the new E-Learning-Guild Acade-my platform. The topic of the keynote session will be "Building an E-Learning Strategy for the Future: Ten Key Shifts to Watch." Session participants will get suggestions for incorporating these new initiatives into their evolving strategy with the least amount of organizational pain. If you plan on attending, stop by our table and say hi. We'll have ProtoSphere up and running on a couple laptops to give visitors a firsthand look at the experience. The event is being held at the Westin Hotel in the Forrestal Center, Princeton, NJ. Doors open at 4pm. You can get more information and register for the event on the chapter's website. The full brochure is also available here.